I am going to attempt to swear off all the rumor sites until after the announcement. A surprise would be nice and if I read a whole week of speculation I’ll just be set up for when the hollyPod wide-screen model isn’t included free with all new 42″ plasma iMacs (you know those powered by 16 Prius hybrid processors). I’m also going to floss twice a day, use the treadmill and brush up my Shakespeare. Ok I’ll bite. It is downloadable movies guys. That’s going to be a hot ticket with a maximum of 757 seats at YBC’s Theater and the potential of another 400-550 if they run an overflow in the venue’s Forum area. Obviously, the Brits are going to watch it from the simulcast, as will a lot of Europeans, but even so, one would have thought that even 1300 seats was underestimating the degree of interest there would be in this launch. @critic: I agree. I think Apple knows this, so they are punting on coming up with a cryptic invitation like they have in the past. 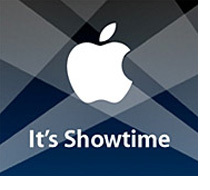 “It’s Showtime” can only point in one product/service direction. Oh, boy, oh, boy! What would it be? Oh, boy, oh boy! But… duh! I guess everybody figured that one out. I apologize. I had to install Windows on a computer yesterday (AGAINST MY WILL!! It was for a friend), and I got stupider, so please bare with me while I recover. – Slightly revised iPod video with 40 GB and 80 GB offerings. The push here is about iTunes movies and the home living room device. The nano w/video is a secondary push to keep iPods on the top of the kids Christmas lists this winter, and the emphasis on the Nano is to move target pricing to the low-end, while Zune struggles to get out the door at the $299 price point. iTunes having a move rental service. For Apple to spring forth a 5-day/auto-delete movie rental service will (IMHO), be a major key for success. Just because Apple has a way to purchase movies does not mean millions of renters are suddenly going to purchase movies… That is not the way it works. I think there’s no doubt it’ll be the addition of movies to iTMS, with the recent slip from Lion’s Gate, but the real question is, new iPods? I’m betting yes. This will be an important event for another reason as well. Those who thought SJ looked ill at WWDC are going to be looking very closely at him this time. Here’s hoping there’s no need for further conjecture.